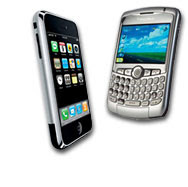 NPD Group on Monday reported that Research In Motion's BlackBerry Curve outsold Apple's iPhone to become the top-selling consumer smartphone in the US in first quarter of 2009. NPD attributed the recent BlackBerry sales surge to an aggressive "buy one, get one free" promotion for the phone by carrier Verizon Wireless. It helped boost RIM's share of the consumer smartphone market 15 percent to capture nearly 50 percent of the market in the first quarter, NPD said in a statement. We offer hosted BlackBerry Enterprise Server (BES) for partners as part of our hosted services. BlackBerry hosting from Pointivity frees partners from all hardware, software and maintenance costs, plus the expense and time of setting up service. If you want to sell a solution that's high in demand with great customer retention rate, BlackBerry email is the prefect complimentary add-on to hosted Exchange in addition to the archiving solution we offer. By the way, we still offer ActiveSync for free, so partners can sell wireless email on iPhone and BlackBerry with our hosted Exchange offering. Can you write a new post about BlackBerry Curve report in 2017? I am keenly waiting to know about all the things going on. As a BlackBerry Curve lover, I appreciate the writing. Thank you so much and Have a good day!